Newly elected Quebec Liberal leader Philippe Couillard says he will focus on his party's renewal and the province's place in Canada. 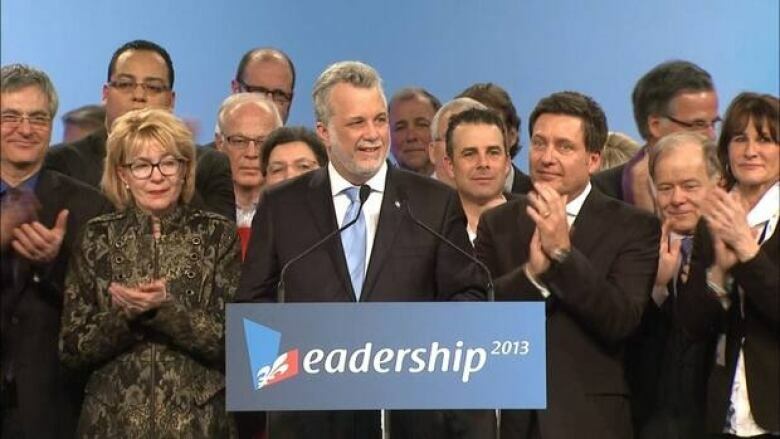 Quebec Liberals have elected former health minister Philippe Couillard as the newest party leader. "Today a race ends, but today a march begins," Couillard told the party faithful gathered at the Verdun Auditorium in Montreal on Sunday. The Quebec Liberals' new leader, who came out of political retirement to win on the first ballot, said he will focus on renewal of the party and strengthening the province's place in Canada. Couillard said he wants to unite Quebecers under the Liberal banner, whether they choose federalism "out of passion, or out of reason." A total of 2,377 party delegates from riding associations across the province voted for the new Quebec Liberal Party leader in what is said to be the last delegated convention in the history of the party. Couillard won the three-way race with 58.5 per cent of the vote. Pierre Moreau, a former transport minister, came in second with 22 per cent while Raymond Bachand, a former finance minister, placed last with 19.5 per cent. Couillard does not have a seat at the national assembly and he said he's in no hurry to seek one. "This is not a priority for me," Couillard told reporters following his victory speech. The former health minister said his first task is, "to mobilize the party. To go around Quebec, to see the members, find candidates, organize regional meetings toward the general convention." "I’m not going to rush to the assembly. I have work to do with the party," Couillard said. But Jacques Duchesneau, a Coalition Avenir Québec MNA and the former head of the province's collusion squad said, that while the Liberal Party now has a leader, it still lacks an Opposition leader to answer the tough questions. Couillard's friendship with Arthur Porter, the former head of the McGill University Health Centre who left Montreal last year amid controversy, haunted Couillard throughout the leadership campaign. Porter is wanted in Quebec on charges of accepting kickbacks in relation to a $1.3-billion hospital construction contract awarded to SNC-Lavalin Group Inc.
"It doesn't mean that he's involved with that … but he has to be at the national assembly to answer those questions," Duchesneau told reporters after Couillard's win. Quebec Liberals have been faced with allegations of corruption which ultimately lead then-premier Jean Charest to call a public inquiry during his final year in office. While Charest has largely stayed out of the public spotlight since his official resignation from the party following his defeat last fall, he was present at the leadership contest. Following the victory, Charest said the former health minister will be "a great leader and a great premier for Quebec." He said he knows Couillard to be a compassionate man with a deep knowledge of the province. Third-place Bachand kept his concession speech brief, saying it was time for Liberals to rally behind their new leader. The Quebec Liberal Party is in a great position to challenge the Parti Québécois, Bachand said. Bachand also congratulated Moreau for running "an exceptional campaign." Moreau, elated with his second-place finish, said "while the leadership race ended a few minutes ago, for us the hard work starts today." "We Liberals are able to unite, we are able to face the music, we have a healthy party, and we will win the next election," he said. Moreau congratulated Couillard, whom he called "a great leader." Couillard could face an election in early 2014 because of the PQ's minority status. Federal interim Liberal Leader Bob Rae congratulated Couillard and assured his party's full support. "His experience in both the public and private sectors will be an asset to the party and to all Quebecers," Rae said in a written statement. While the losing camps had supporters in green scarves or purple T-shirts, Couillard’s crowd was more incognito. They erupted in noise when he took the stage, though, banging on Liberal-branded thundersticks and clanging on noisemakers. In his speech before the voting, Couillard extolled a message of Liberal unity and renewal. The speech gave a nod to former premier Daniel Johnson, who was in the building, as a person who won "the battle of Canada." Couillard told the room that he wants to lead the most open government the province has ever seen. He said Quebec is having a crisis of confidence that can only be solved through transparency. Moreau gave a rousing address that referred to the Liberal's fall from a majority government to the Opposition. "Last September, Quebecers sent us a strong message," he said. "We owe it to them to honour this choice and act on that message. We must view our new role as the Official Opposition to plan and prepare our future." Bachand addressed English voters directly, promising that a Liberal government would respect everyone in the province. "You, Anglo Quebecers, you are part of Quebec's history and you are essential to Quebec's future. "Some of you think that the Quebec Liberal Party takes you for granted. Today, I make this commitment to you: I do not and I will not take you for granted," he said. The party used the first day of its weekend convention on Saturday to pay tribute to Charest, who led the party for 14 years, including nine as premier. After being greeted with a lengthy standing ovation, Charest made a passionate plea for national unity and reminded Canadians how important Quebec is to Canada. "Canada is our home, and all those who live outside of Quebec should know that Quebec is also part of their home and their heritage," Charest told the crowd. The staunch federalist also took a jab at the PQ government, which has made preserving the French language a key issue since taking office. He said that English-speaking Quebecers deserve to be treated with respect. "You are not strangers in this province and you are not strangers as citizens of Quebec," he said, speaking in English during what was a mostly French address. "Every one of us have a right to vote, we have a right to be part of this society and we have a right to be fully accepted as citizens of Quebec. And that's what this party stands for." In his final years in office, Charest's party faced allegations of corruption that ultimately led him to call a public inquiry. But he said he has no regrets about his time in office, particularly his efforts to increase university tuition fees, even if they led to months of street protests. Learn more about the three candidates here.